In apparent riposte against the hard line led by Israel, US top diplomat defends negotiations with Iran. US Secretary of State John Kerry forcefully defended diplomacy as the way to try to resolve the dispute over Iran's nuclear weapons program, in an apparent riposte to Israel. In a speech Monday night at a disarmament forum, Kerry said that in the talks with Iran, the United States has "an opportunity to try to put to test whether or not Iran really desires to pursue only a peaceful program, and will submit to the standards of the international community in the effort to prove that to the world." He added: "I suggest that the idea that the United States of America, as a responsible nation to all of humankind, would not explore that possibility, would be the height of irresponsibility." In what AFP said was a “response to the Israeli demand for more pressure,” Kerry said "some have suggested that somehow there's something wrong" with giving diplomacy a chance. 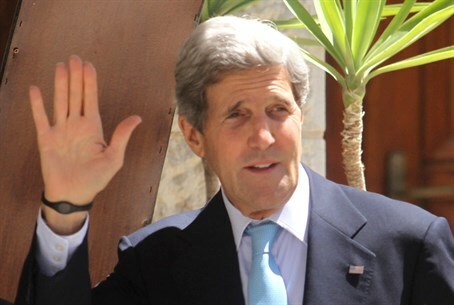 "We will not succumb to those fear tactics and forces that suggest otherwise," Kerry said. Iran is to hold a new round of talks on the issue with six world powers in Geneva on November 7-8. This follows a round this month that resumed long stalled negotiations. Israel is demanding four conditions before international sanctions on Iran are eased: a halt to all uranium enrichment; the removal of all enriched uranium from its territory; the closure of an underground nuclear facility in Qom; and a halt to construction of a plutonium reactor. Saudi Arabia, too, would like to see a tough US stance against Iran. The Obama administration has said it is important to test the sincerity of Iran's promise to hold serious discussions on its nuclear program.